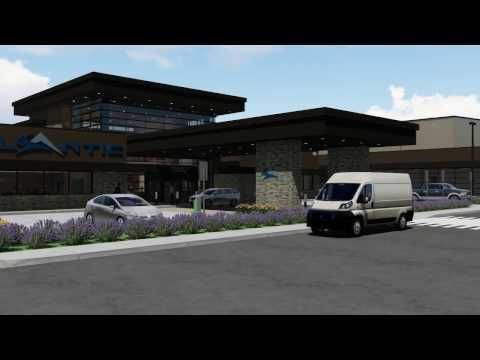 In this multi-phase project, new facilities will replace old as Atlantic Aviation enters into the Salt Lake City market. In the initial phase, JRMA designed and engineered a new FBO and two new hangars with office space. These replace two older hangars, an FBO and an airport executive terminal. The redesigned facility will improve the utilization of the leasehold and enhance the design of the general aviation area of the airport to match that of the new commercial terminal renovation. The exterior takes it cues from the mountain lodges of the nearby Wasatch Range. The terminal, which will be placed between the two new hangars, serves as a gateway into Utah while also keeping circulation centralized within the building. A large stone fireplace, stone floor, and wood ceilings and trim not only make the FBO unique to Salt Lake City but also create a transitional space for guests as they move to and from landside and airside. The hangars’ design is reminiscent of the FBO with a more practical approach. Both the FBO and hangars will be set on rock-column foundation systems, a solution to combat subpar soil. A large clear-span will form each hangar without obstructions on the floor thanks to a pre-engineered metal building system while a new fuel farm and renovated ramps will guarantee access to all needed services. The overall design also sets the stage for future renovation of the other two existing hangars at the facility was well as other improvements in the area.